This unique and informative video is a must-have resource for both female and male gymnasts and coaches at any level. 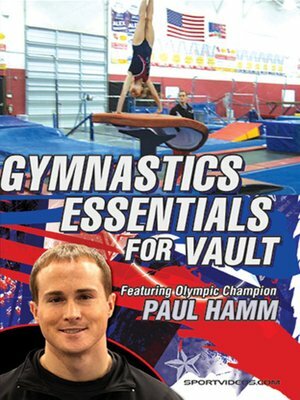 The program provides personal lessons from World Champion and a three-time Olympic medalist, Paul Hamm. Among the topics in this vaulting video are: running drill, hurdle drill, vault drill, blocking drill, block rotation drill, rotation drill off springboard, front handspring vault, roundoff vault, tuck Tsuk vault, pike Tsuk vault, layout Tsuk vault, handspring front tuck, handspring front pike, handspring front layout with a 1/2 twist, layout Kaz, Kaz full with one twist, Kaz full, Yurchenko tuck, trampoline drills, handspring vaults, Tsukahara vaults, Kasamatsu vaults and Yurchenko vaults. Another feature of this video is detailed video analysis, using voice over, drawing tools and slow motion. This method of teaching is extremely beneficial and will help you develop a deeper understanding of the complicated techniques in gymnastics.